Delta FF out with BMWs in Scotland! 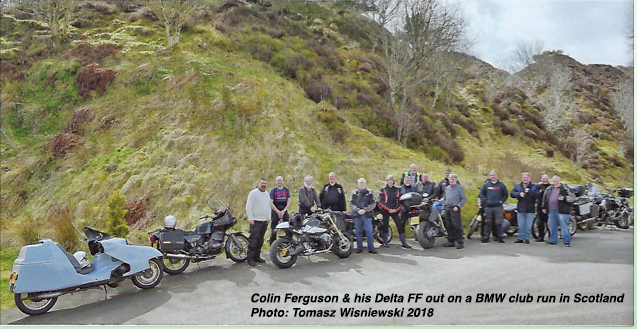 Colin Ferguson took his Delta 930 FF out on a BMW club run in Scotland, and was mentioned in the club magazine write-up! Submitted by pulhamdown on 06-Jun-18 7:38am. This photo illustrates rather well the difference in wheelbase between my Delta, and ordinary motorised bicycles. Wouldn't mind a go on that mildly customised R Nine T, though.